Do you have photos, historical accounts or other items pertaining to the Hayfield area? Would you like to share this historical information with the world? LakesnWoods.com would like to publish your Hayfield photos (current or historical) or historical accounts on this website. Original materials can be returned and your privacy will be respected. 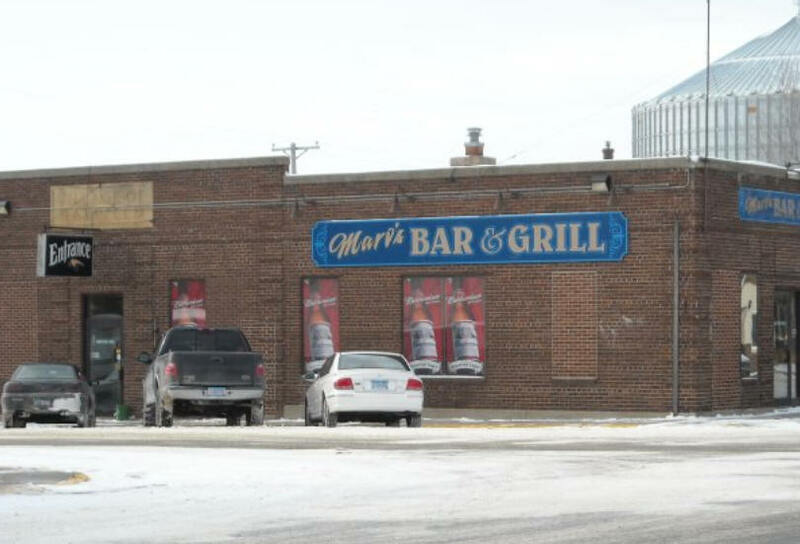 Welcome to Hayfield, MN, a sprawling community of 1,300 residents nestled on the corner of Highway 30 and 56 and is almost equal distances from Austin and Rochester in south-east Minnesota. 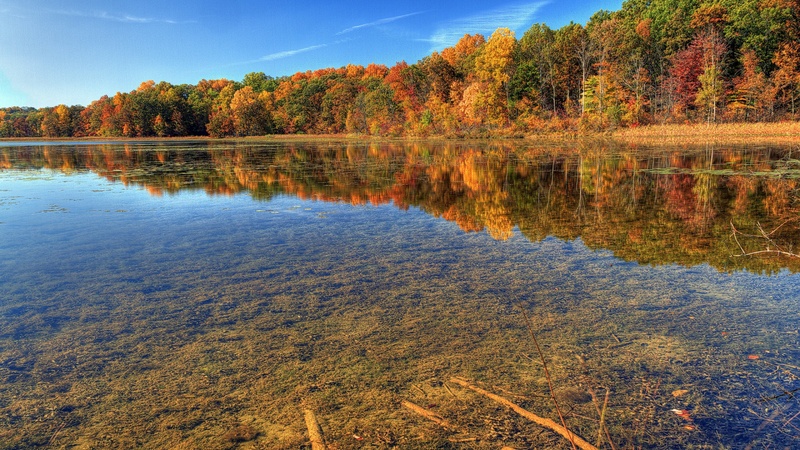 Hayfield is "close enough to Rochester, but just far enough away" and prides itself with a booming local economy with over 40 local businesses. 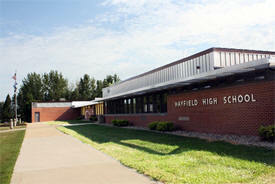 With one of the strongest school districts in the region, Hayfield is a great place to raise your family. Students in the Hayfield Community Schools are taught in a "person-centered" environment and with approximately 900 students and 65 teachers, the schools can give your children the education and attention they deserve and the peace of mind you desire. 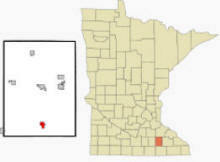 Hayfield is a city in Dodge County, Minnesota. 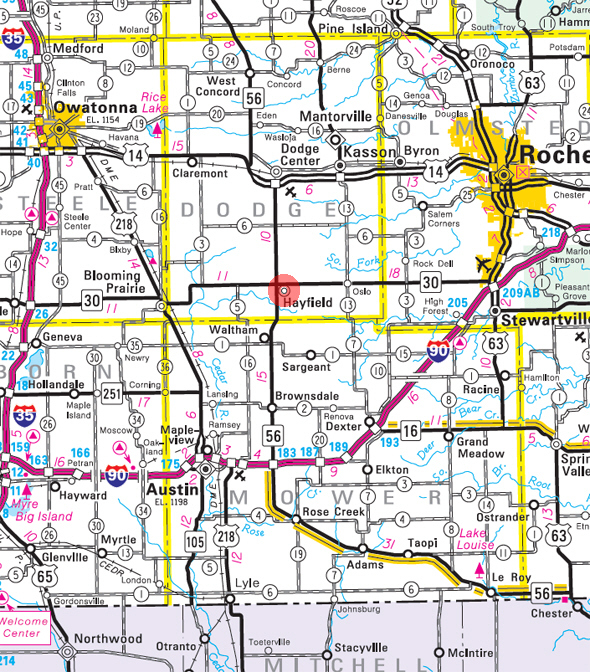 Minnesota State Highways 30 and 56 are two of the main routes in the community. According to the United States Census Bureau, the city has a total area of 1.27 square miles (3.29 km2), all of it land. The elevation is 1,319 ft (402 m) above sea level. As of the census of 2010, there were 1,340 people, 547 households, and 348 families residing in the city. The population density was 1,055.1 inhabitants per square mile (407.4/km2). There were 597 housing units at an average density of 470.1 per square mile (181.5/km2). The racial makeup of the city was 95.4% White, 0.4% African American, 0.5% Native American, 0.1% Asian, 0.1% Pacific Islander, 1.6% from other races, and 1.9% from two or more races. Hispanic or Latino people of any race were 5.5% of the population. There were 547 households of which 34.6% had children under the age of 18 living with them, 45.9% were married couples living together, 11.2% had a female householder with no husband present, 6.6% had a male householder with no wife present, and 36.4% were non-families. 32.7% of all households were made up of individuals and 15.2% had someone living alone who was 65 years of age or older. The average household size was 2.37 and the average family size was 2.95. 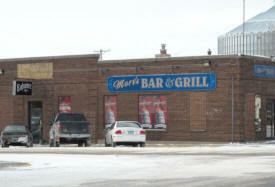 The median age in the city was 36 years. 27.2% of residents were under the age of 18; 7.6% were between the ages of 18 and 24; 24% were from 25 to 44; 23.3% were from 45 to 64; and 17.9% were 65 years of age or older. The gender makeup of the city was 48.7% male and 51.3% female. 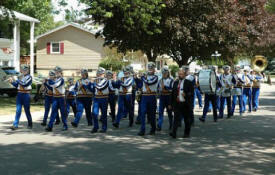 HAYFIELD Township was organized March 30, 1872, having previously been a part of Vernon. 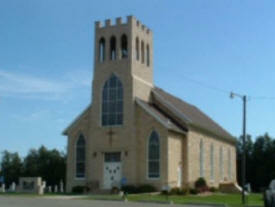 Its name was adopted from a township of Crawford County in northwestern Pennsylvania. The city of Hayfield, sections 15 and 22, was incorporated January 7, 1896; it had a station of the Chicago Great Western Railroad, and the post office was established in 1885; the Vernon Co-operative Creamery near Hayfield is the oldest farmer-owned creamery in the state. Alter Metal Recycling is one of the nation's leading scrap metal recyclers and brokers, with processing centers and offices throughout the central and southern United States. We also have representative sales offices in Shanghai and Hong Kong, China. Built on honesty and integrity, Alter Metal Recycling fulfills its commitment to its customers and the communities in which it operates as it sets new standards for the industry. 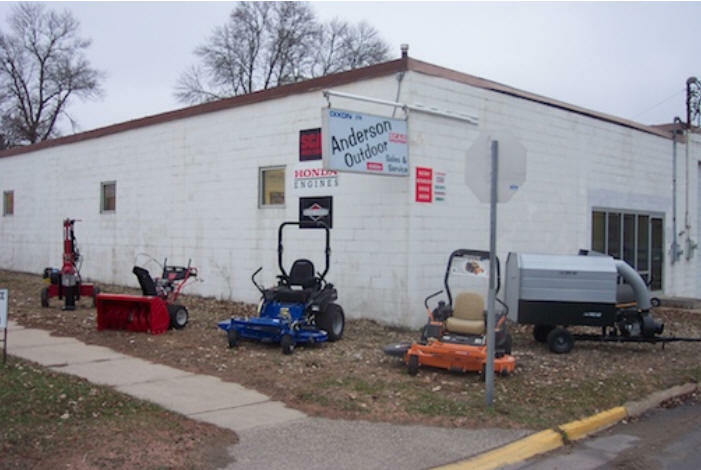 Anderson Auto Center has been providing quality car care in Hayfield, MN since 1986. We are a family owned business delivering honest and professional automotive repair and auto maintenance services to the people of Hayfield and surrounding areas. The quality ASE (automotive service excellence) certified technicians at Anderson Auto Center employ today’s latest automotive technology and are equipped to handle all major and minor repairs on foreign and domestic vehicles. We look forward to helping you with your purchase of lawn mowers, golf carts, heaters or other power tools. We also service small engines and all of our products. As a homeowner, the last thing you want is a major plumbing problem that can cause sewage leaks and even structural damage to your home. That's where we come in. At Beaver Plumbing, we specialize in new construction plumbing, but we also offer a full range of general plumbing services. From installation of new fixtures to water conditioning, sewer and drain cleaning, water heater installation and repairs, we do it all. Cardinal Realty is a full service Real Estate and Appraisal agency servicing Southeast MN and the Minneapolis-St. Paul metropolitan area. Cardinal Realty's friendly staff embraces a dedicated work ethic with a personal touch. This philosophy has allowed us to grow steadily over the last twenty years. Central Valley Cooperative is a full service agricultural supply and marketing cooperative serving southeastern Minnesota. With revenues of over $250 million per year, 165 full-time and over 100 seasonal employees, Central Valley Cooperative has a significant impact on the local economies it serves. 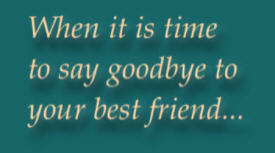 May we extend to you our heartfelt condolences on the loss of your animal friend. Pets are family members who deserve our ongoing love and respect. Our goal at Cherished Pet Cremation is to provide pet owners the opportunity to memorialize their fallen friend in a respectful, high quality manner. Citizens State Bank has always had a commitment to Hayfield, Mantorville, Dodge Center and the surrounding communities to deliver top of the line products and services. Our financial services include competitive loan and deposit rates, telephone banking and internet banking. 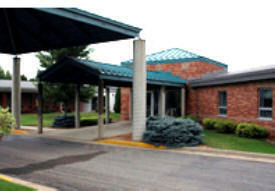 The main office is at 216 1st Ave NE, Hayfield, MN 55940 including an attached drive-up facility. 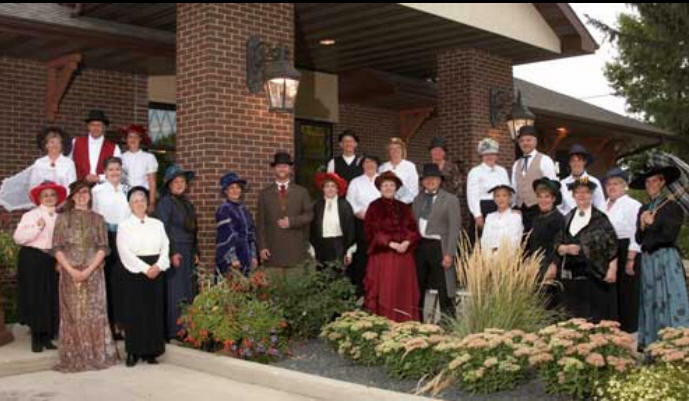 The Czaplewski Family Funeral Homes has a long and proud commitment of providing dignified and caring service to families in Dodge and Mower Counties and the surrounding communities. It is our hope that the information on our website is helpful to you. Field Crest Care Center has provided quality care in Hayfield for 40 years. Located in the small, progressive city of Hayfield, Minnesota, Field Crest Care Center is just minutes from Rochester, Austin and Owatonna. 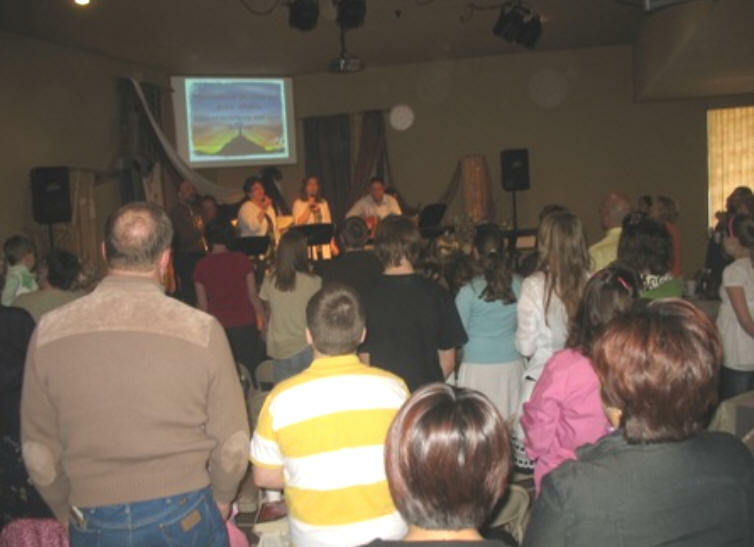 Field Crest is a municipally owned, not-for-profit facility that is dedicated to its residents and community. Field Crest Care Center provides residents with the services, choices, and a quality of life not always found at other care centers. The dedicated staff treats each resident with the respect and dignity they deserve. 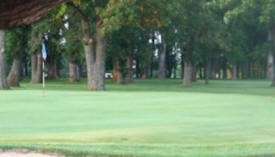 In the Rochester, MN area, Green Acres Hydroseeding has great options regarding lawn care, landscaping and so much more. We pride ourselves on our outstanding reputation and are committed to providing great service to you. Please call us today, as we provide winter services as well. 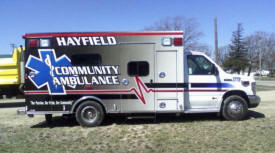 Hayfield Community Ambulance is a small group of Volunteers from South Eastern Minnesota. 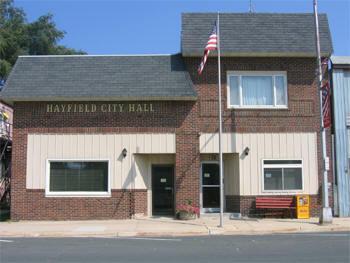 We provide Ambulance and emergency services to the City of Hayfield, Minnesota and surrounding rural area. We operate with trained First Responders, Ambulance drivers and certified Emergency Medical Technician (EMT’s). We also work with and beside our local Volunteer Fire Department. 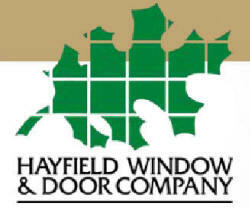 Hayfield Window and Door Company makes it our mission to offer you economically-priced, energy-efficient residential windows and doors that fit your style and needs. For more than 50 years we have been producing elegant, yet affordable window and door solutions. Jolene Schimek CPA, Ltd. is your complete Tax and Accounting professional. Our main office is located at 118 2nd Ave NW in Hayfield, with a satellite office in Stewartville at 200 South Main St. Jolene and her staff proudly boast of their small town roots and values with strong emphasis on support of local businesses and organizations. We offer a number of services to small business, farm, corporate and individuals including tax services of all types; payroll preparation for small business; business advisory services including monthly bookkeeping and financial statements, and cash flow consulting. 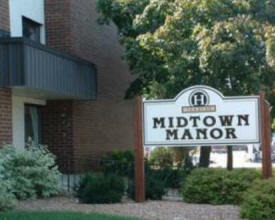 Hayfield's premier senior's apartments! 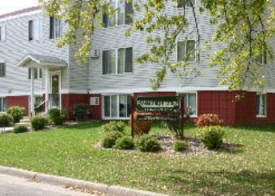 Beautiful one bedroom apartments located in historic Hayfield, MN. On-site enjoy the extra amenities such as: secured entrances, elevator, laundry facilities and a large community room and patio for social gatherings. 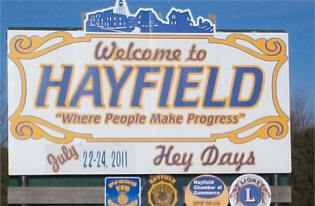 Hayfield offers a friendly small town atmosphere with the larger city amenities just a short drive away. Rent at this property is based on income. For year-round care of your lawn and landscaping needs, contact Mike’s Full Lawn Service, Inc. of Hayfield, MN. With 20 years of experience, we have been providing trusted solutions for both residential and commercial property needs. We are licensed and insured for your protection. At NELSON'S GAS, INC., we're proud of our years of service to the Hayfield area and look forward to helping you with your air conditioning and heating needs. We're pleased to serve both residential and commercial customers; our team is prepared to help you with the sales, service, and installation of the comfort system that is ideal for your home or business. When you combine technology, skill, and dedication, you have found the company you want working for you. South East Minnesota Realty, Inc. is an independently owned company with a long list of satisfied customers. Let me or one of my qualified agents assist you with your next real estate transaction. Viking Realty specializes in farm and residential properties. With years of farming experience, as well as being longtime residents of Hayfield, we know what's important in owning rural property. For service that's never-ending, call us for your rural home or farm needs.